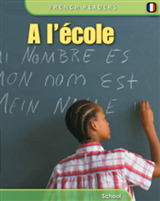 An entertaining and effective introduction to French for children aged 5-10 years old. 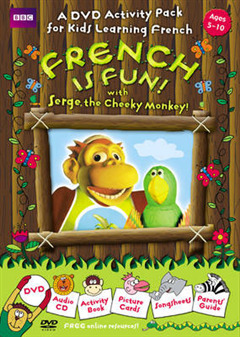 Featuring the animated characters of Serge, a lovable but cheeky monkey, and his clever friend Pascale the parrot, this fun-filled language pack will really make your children want to learn French. 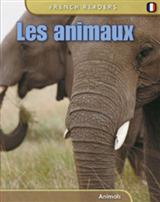 A range of activities on topics such as greetings, colours, sports, animals, likes and dislikes, and food and drink will get children used to both hearing and speaking French. 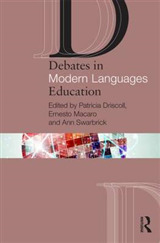 Course components: DVD Ten 15-minute television programmes, each based on a separate topic, give children a wide variety of interesting and relevant language. 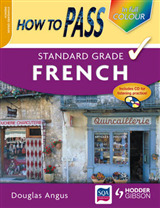 Extra features include subtitles in French and English, plus interactive games to help reinforce language skills. Activity Book With its comical characters and absorbing activities, this colourful activity book includes fun and effective language practice through 40 pages of games, puzzles and cartoon stories. Audio CD Featuring songs and stories from the DVD, this entertaining 80-minute CD also includes games and pronunciation practice linked to the activity book. Picture Cards 48 fun-to-use cards present key language and vocabulary in a clear and attractive format. The possibilities for games are endless! Song Sheets Sing along to all the catchy songs from the television programmes and CD. 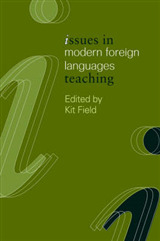 Parents' Guide Explains the key language and offers tips on helping your child to get the best out of the pack.